If you’ve ever wanted to see our products in action, learn more about what we do and get live experience with our software and automation solutions, this is your chance! 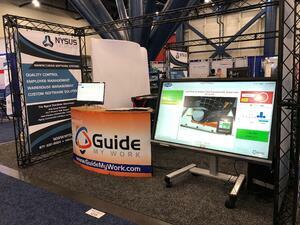 - And Our Newest Software Solution: Guide My Work! Take Advantage of Our 15-Day FREE TRIAL By Signing Up Onsite! We'll also be featuring numerous Robotic Integration projects in our newly expanded facility! Come and see what our Automation Team is capable of in over 4,000 sq.ft. of warehouse space designed to accommodate full robot cells. Check out what we've been up to lately here! Plus, you’ll get to meet the Nysus team and enter in our Mud Hens ticket Giveaway Contest*! Get out of the office and see how Nysus Solutions can assist with your manufacturing needs. *Toledo Mud Hens tickets are applicable for that evening's game (5/3/19). Register today for your Free Tickets! And feel free to invite your colleagues and friends. The more, the merrier! Be sure to visit www.Nysus.com to see what Nysus Solutions can do for your manufacturing operation! Can't make it to the Open House? No problem! Check out our upcoming trade show lineup for your chance to see Nysus in action. Contact us for more details!